Spread over 18 skilled, assisted living facilities in North Charleston are over 1,900 beds available for aging loved ones that need care. 1,900 beds for 1,900 wives, husbands, parents and grandparents who deserve to live in a peaceful, saw and supportive environment… But there is a dark side to elder care facilities. The same 1,900 beds opens the door for 1,900 instances of abuse and neglect. If you believe your loved one is the victim of such abuse, let us help. The law is on your side! Green Law Firm will work tirelessly to right the wrong that has been done to your family member during this vulnerable time in their life. At Green Law Firm we strive to educate and assist you. Reliable information to guide you, and legal experience you can count on. Here are six things you need to know about filing a claim for nursing home abuse and neglect. 1. A nursing home or elder care facility can be held responsible when incidents of negligence or abuse happen on their premises, and these incidents cause harm to patients and residents. Failing to maintain a facility, keep it safe and keep residents free from harm. Negligent hiring, in bringing an employee into the premise who ends up abusing, neglecting or intentionally hiring a patient. This also covers the failure to properly train staff members. Failing to maintain health standards and relevant safety requirements. For example, are rooms kept sanitary and clean? Failing to provide required and adequate medical treatment. Federal regulations establish strict standards of care. If a facility accepts Medicare, they must comply with a variety of rules and regulations. On, in particular, is very important: 42 CFR sec. 483.25 (h) is essential when it comes to determining if a nursing home facility can be sued. This regulation states that a resident facility must remain as free from accident hazards as possible. It also states that every resident of the facility must receive enough supervision and have access to enough assistance devices that accidents are mitigated and preventable. If an accident occurs and it is proven that the above requirements have not been met, you can sue. 3. 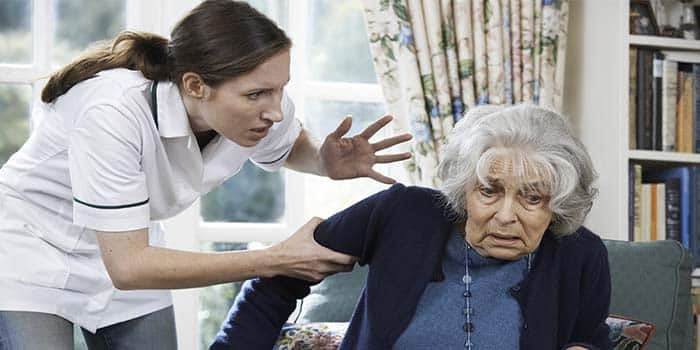 There are six common types of elder care abuse. Proving any of the these has occurred is grounds for legal action. 2. There is a difference between “abuse” and “neglect,” but both are grounds for legal action if proven sufficiently. Elder neglect is far harder to prove because it can mean so many different things and can vary greatly on a case by case basis. In its most basic form, elder neglect is when a caregiver fails to fulfill the obligations needed to a person’s care. Both abuse and neglect can be exceptionally hard to prove. This is one of the main reasons an experienced legal team is your best asset! If you believe your loved one has experienced abuse, we can help. 1. In cases of nursing home abuse and neglect, many people may be held responsible. The more people are involved, the more complex the case becomes. The main entity held responsible in cases of nursing home abuse and neglect is the facility itself. The facility is also “vicariously liable” for the actions of employees, third parties and contractors employed to offer care to residents. If someone you love has been the victim of abuse, we will fight for their safety! You are the best advocate for your loved one’s wellbeing and care; if you believe abuse is occurring, the BEST thing you can do is speak up! Green Law Firm will make sure the person you loved for is safe and cared for with the attention and respect they deserve. Ongoing abuse can be reported to the South Carolina Department of Social Services (DSS) and, as always, in an emergency situation, call 911! Wrongful death, in the most severe cases. Process your case and negotiate a settlement or elevate the case to court if needed. There is nothing we can do to erase the pain that comes with knowing someone you love has been abused and taken advantage of. There may be no abuse more egregious than that done to a person who can not suitably defend themselves. Contact on of our South Carolina nursing home abuse lawyers at 843-747-2455 any day of the week, 24/7 for a 100 percent risk-free case review today. Our attentive team will be with you through every step of the process and do what it takes to get your loved one the justice that they deserve!